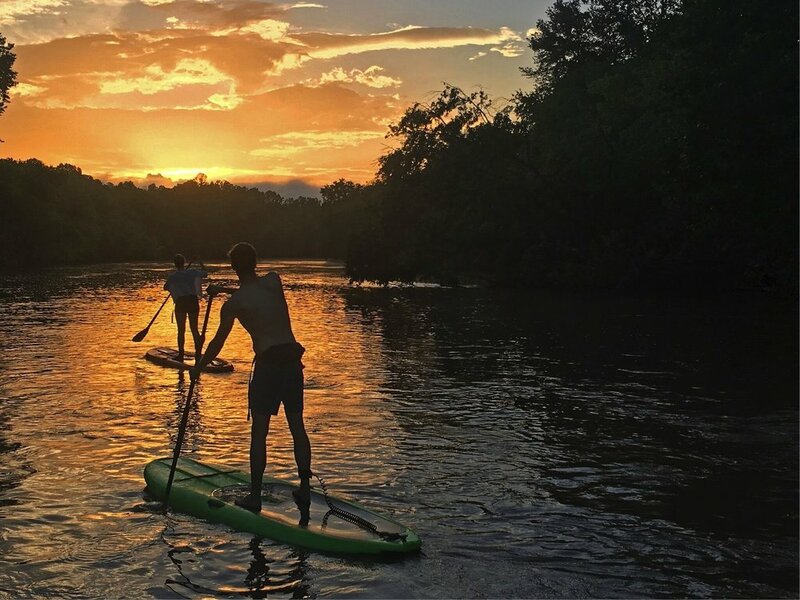 If this is the summer you finally decide to paddleboard in Asheville, we’ve compiled a list of 17 reasons why Wai Mauna Asheville SUP Tours is the best choice for standup paddling in Asheville. If you have a question about any of our trips you can reach us by phone at (828) 808-9038, or conveniently book a trip online to get you out on the water! 1. We’re the only company offering guided tours, which are all completely private! Imagine having a private instructor that accompanies you down the river, who not only teaches you how to balance, paddle, and do a few tricks, but also tells you the history of Asheville and serves as a local guide. That’s what you’ll find with our guided SUP tours, which are all completely private tours and personalized for your group. There’s no paddling with other groups, so you get the attention of a professional instructor who can help you navigate down the river and ensure your comfort and safety. 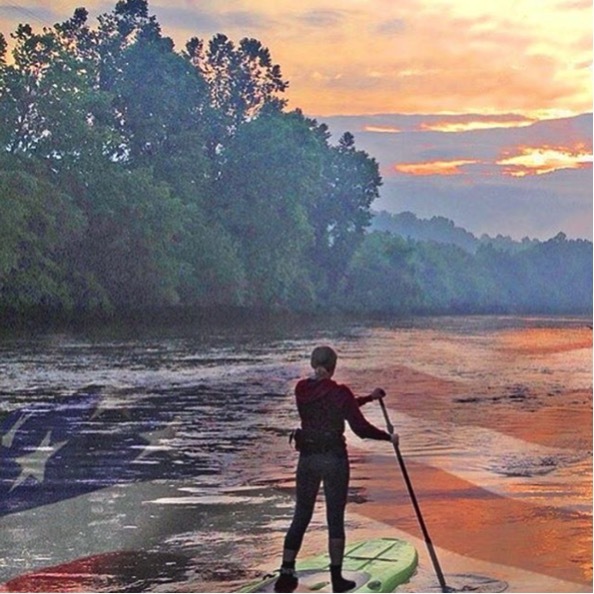 If you’re looking for Asheville paddleboard rentals we offer the lowest-priced rentals in town! Just $39 for our 4-mile paddle, and $44 for a 7-mile paddle that goes through the Biltmore Estate. That’s the final price out the door—no hidden taxes or fees! All of our instructors are professionally certified by the American Canoe Association, and they complete rigorous, multi-day training courses to become certified paddleboard instructors. Some people like to go barefoot while paddling while others like to wear shoes, and we’re the only company offering complimentary booties if you don’t want to bring your own! That’s right—you get a FREE PADDLEBOARD LESSON with every Ashevillle paddleboard rental. We don’t just shuttle you up to the river, drop you off, and say “have a good time.” We park the van, carry your gear to the river, and literally get in the water with you to give you a lesson until you feel comfortable. We’ll show you the right way to hold the paddle and where to stand on the board, and offer suggestions on steering, stopping, and how to avoid the rocks. Your safety and enjoyment is our number one priority, and our goal is to help you learn how to paddle—not just rent out boards. Not all lifejackets are created equal and some are more comfortable than others. That’s why we offer the belt pack style of lifejackets, which are designed to be worn like a fanny pack and fit snugly around your waist. They’re equipped with a C02 cartridge you can deploy in the event of an emergency, and even though they're more expensive than traditional, inherent lifejackets, it’s an added cost we’re happy to pay if it means you’ll be more comfortable. There are all different types of paddleboards, and if you rent a thin, narrow board when it’s your first time standup paddling, chances are it will be a bit wobbly and you won't have a great experience. That’s why we offer Imagine Surfers, which are 9’9” x 34 inches wide and made from a blow molded plastic, which not only means you can bump them into rocks, but they’re solid, stable, easy to use, and perfect for first time paddlers. You know what our staff does when they get a day off? They grab their boards and go paddling. We are passionate, dedicated standup paddlers who train for races, are constantly learning, and love helping others experience the stoke of standup paddling in Asheville. The owner, Kyle, is a team rider for JP Australia and races on the professional circuit. Two of our guides, Holly and Les, race on the local Southeastern circuit, and Tom is one of Asheville’s top paddlers when it comes to paddling whitewater. Danelle is another whitewater specialist who's considered one of the nation's top female whitewater standup paddlers, and Eric is becoming a regular face in the whitewater standup scene. We’re all about giving back to the river, and portions of proceeds from every paddler are directly donated to RiverLink. Since we first opened in 2015 we've donated nearly $3,000 to help clean up the river! How’s this for super convenient? You rent a house that’s right on the lake, but instead of renting boards from a shop and then strapping them down to your roof, we bring the boards directly to your door and pick them up when you’re done. Yes, you read that right: We’ll deliver paddleboards directly to your lake house and you don’t have to lift a finger. We currently service Lake Lure, Lake James, Lake Summit, Lake Adger, and lakes in Connestee Falls. 12. Our crazy, 6-person SUP board! If you’ve already been whitewater rafting in Asheville and are looking for something new, try out our brand new, 6-person SUP board, Asheville’s craziest new river adventure! You don’t need to drive an hour from town, you finish within minutes of restaurants, and if you can either do a guided tour or rent out the board with 6 friends! If you’re looking to improve your paddling stroke or work on specific skills, our professional instructors offer private lessons at Lake Julian or out on the river. The French Broad River gives us our livelihood, our exercise, and our peace, so the least we can do is give back to the river by helping to clean it up. As a way to give back to the Asheville community, we offer our weekly Malama Asheville Fundraising Paddle, where $15 from each rental is directly donated back to the Asheville non-profit or group of choice. 16. Gear That's Made in the USA! Our Imagine Surfer paddleboards are made right here in the USA from a recyclable, polyethylene material, and our Kialoa paddles are made in Oregon—we support American manufacturing! We hold ourselves to an exceptionally high standard in terms of customer service, and we’re a company where we know every paddler by name, and “No” is never an answer. We aren’t here for us, we’re here for you, and we make your safety, needs, and concerns our number one priority. Running late? We’ll work to reschedule. Hungry? We’ll give you a Clif Bar. Even if it starts to rain on the paddle we’ll give you the jacket off our back. This uncompromising, personalized service is probably the reason we’re Asheville’s #1 Water Sports company on Trip Advisor, and our goal each day is to be the highlight of your entire summer in Asheville. Enough about us—let’s hear about you! Leave us a comment or drop us a line on our Facebook, Instagram, or Twitter, and we’re stoked for another awesome season of standup paddling in Asheville! Older PostAsheville Off Season Paddleboard Rentals—Just $200 for 6.5 Months!